New number one Craig Cook was delighted to lead Panthers to victory at the end of his debut - after earlier getting a shock from the East of England Showground track. Cook admitted he was caught out by the slicker-than-expected surface when retiring from his opening ride for the city club last Sunday (May 22). 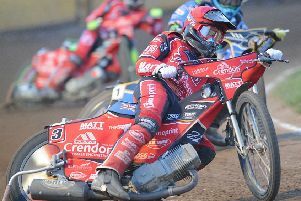 But he quickly got in the groove to pile up an 11-point haul which included success in a final-heat decider to earn a 48-45 verdict against Ipswich in the two sides’ last League Cup, Midland Group clash. Cook said: “I had completely the wrong set-up on the bike for my first ride. I’ve always been used to there being more dirt at Peterborough in the past. “But I managed to adapt quickly. It was good to score a few points and win that last race to make sure we came out on top. And despite a double-figures debut, Cook insists he has much more to offer as Panthers bid to reach the Premier League play-offs.